This year's strike wasn’t the first time West Virginia witnessed an organized teachers' rebellion. West Virginia's teacher strike in 1990 lasted eleven days. March 7, 2018 is the date that ended West Virginia’s nine-day long wildcat strike of educators and school service personnel, the longest such strike in the state’s history. It is also the date that, twenty-eight years ago, marked its precursor. On March 7, 1990, educators in forty-seven counties formed picket lines in front of their schools, refusing to re-enter until a compromise had been met. 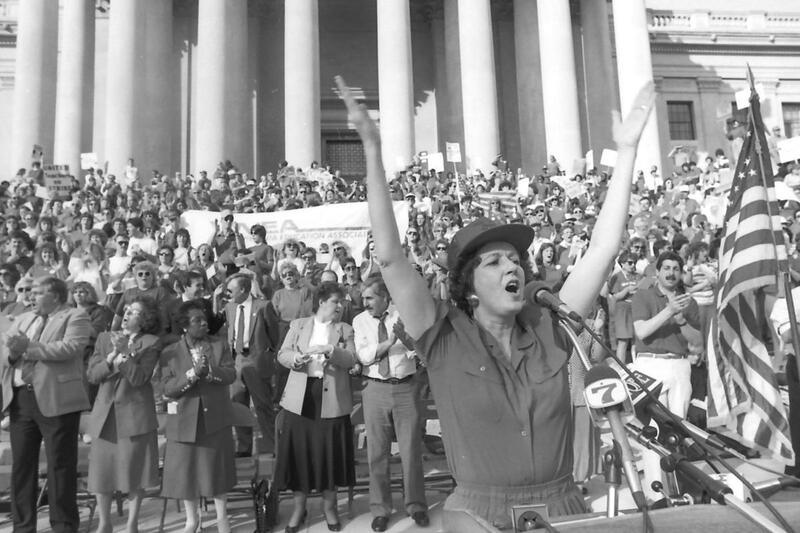 To those outside West Virginia, the 1990 teacher strike holds little significance. There are no compendiums on the strike, no memorials to commemorate it, few videos that catalogue it, and only a handful of national articles that described it contemporaneously. Yet to adequately understand the 2018 West Virginia strike, one must understand this history. The history of the Mountain State is one of rebellions. Chief among these was the Battle of Blair Mountain, when ten thousand rebelling miners were brutally put down by management’s private army with help from the US military. The bosses’ victory, of course, turned out to be a Pyrrhic one; the United Mine Workers eventually organized the entirety of southern West Virginia. When the 1990 teacher strike arrived, this legacy of militant unionism was still a palpable reality for many West Virginians. Just weeks before the teachers walked out, Pittston coal miners had ended a militant ten-month strike, centered on Virginia and West Virginia, that had frequently taken turns into illegality. The Pittston strikers won their central demands, forcing the company to reinstate benefits and invest millions of dollars into a retirement fund for older miners. While the UMWA was fined $64 million for miners’ illegal tactics, and many strikers accrued backbreaking debts over the ten-month period, observers collectively understood the strike to be a success. “Labor winning here,” said UMWA president Cecil E. Roberts, “helped to turn things around for the entire labor movement.” Teachers got the message. Two weeks after the Pittston Coal Strike ended, they mounted what would then be the largest statewide strike in West Virginia’s history. Prior to the 1990 teacher strike, the average annual salary for public educators in West Virginia was a dismal $21,904, making the Mountain State forty-ninth in teacher pay. The public employee’s insurance plan had a six-month backlog, while the retirement fund was short by $2 billion. In this period, West Virginia’s public services budget became depleted as only meager tax hikes were introduced and corporate subsidies ballooned. Despite pressure from West Virginia Education Association (WVEA) president Kayetta Meadows, the 1990 winter legislative session offered no solutions. A new pay package that would have incrementally increased teachers pay could not be agreed upon by the governor’s office or the legislature. Both Utah and Washington State had seen one-day statewide teacher strikes that year over similar issues, but given the magnitude of challenges facing West Virginia, Meadows and others knew that a strike in West Virginia could not resolve the systemic issues they needed changed in a single day; they would need to play a long game. So forty-seven of the state’s fifty-five counties voted to strike. The state’s attorney general, Roger Tompkins, declared the strike unlawful and mailed teachers formal letters demanding that they return to work and halt the unlawful work stoppage. To blunt his threats, the sixteen-thousand-member strong WVEA joined forces with the then-small branch affiliate of the American Federation of Teachers (AFT) in a loose affiliation with their members, though not leadership (who never officially endorsed the walkouts), to persevere and halt scabs from breaking union lines. In the beginning, local news stations could only show scattered groups of teachers protesting outside schools, since many of these areas are predominately rural and employed few teachers overall. But soon, coal miners arrived to reinforce the teachers’ picket lines, especially in the Southern counties, where coal was a staple of the local economy and a portion of the Pittston coal strike had taken place. They provided a new sense of togetherness, and demonstrated to the legislature that the teachers were gaining allies. One participant recalled that as the movement grew, her house came to be dubbed “Strike Central.” News flow and communications between her county’s education association and the strikers maintained pressure on the state. Unlike the most recent teachers strike, which was organized primarily through the secret Facebook group West Virginia Public Employees UNITED, complex phone trees and local meeting places were organized by building reps and impromptu community leaders. On the picket lines, seven teachers in Kanawha County — home to the state’s capital — were arrested for blocking school buses. One picketer was hit by an enraged parent’s car and suffered a torn ligament as a result. Administrators were also split on how or if to support the teachers. Whereas this year, strikers received statewide support from superintendents, in 1990, that was not the case. Some administrators threated to fire teachers who joined the picket line, and in the aftermath of the strike, teachers who called off or refused to enter the building were not paid for their time, though this varied by county. The average loss of income for teachers was roughly $660 (or $1,263 in 2018 dollars), a significant amount for many struggling families throughout the state. But by the weekend after the strike was declared, Caperton was forced to sit down for two days of intense negotiation with Meadows. Caperton agreed to organize a statewide “education summit” that would provide for “appropriate legislative action,” albeit at an undetermined time. This vague proposal did not set forth specific issues to be discussed, nor how to provide funding for the summit’s proposals. Meadows wasn’t fooled. She hadn’t forgotten the attorney general’s union-busting posture, and saw Caperton’s proposals as an attempt to delay a confrontation until the state had maneuvered the union into a more defensive position. So she vowed to keep up the walkout until the legislature put forth a specific timetable for the education summit, along with guidelines for implementing a change in policy. Caperton, realizing that threats of lawsuits could not quell the strike, capitulated and gave in to teacher demands. The strike lasted eight work days — from March 7 through March 18 — and in that short amount of time, West Virginia educators won a resounding victory. Public educators would receive an additional five thousand dollars in pay, spread out over a three-year period, in order to keep up with cost-of-living adjustments and the average pay of contiguous states, bringing West Virginia up to just under half the average teacher salary across all fifty states. New classifications were set up for individuals with graduate credit hours beyond a master’s degree, incentivizing teachers to pursue continuing education courses and bringing in the latest research-based practices into their schools. The public employees insurance plan would be fully funded so that premiums would not increase and medical bills would be paid in full. The $2 billion gap in retirement funding would be addressed in future budgets, as the state agreed to allocate future revenue to it and to stop diverting money designated for educators’ retirement. The 2018 and 1990 West Virginia teachers’ strikes — separated as they are by almost three decades — are remarkably similar. In 1990, educators were squeezed by an underfunded and overloaded public insurance program; similarly, in 2018, their premiums were inflating while their pay remained stagnant. The second time around, the state was planning to increase premiums by 15.2% in 2020, 14.3% in 2021, and 10% in 2022 for all public employees, while retirees on Medicare would be hit even harder: 38.9% in 2020, 29% in 2021, and 32.8% in 2022. Teacher pay once again failed to keep up with the times. When calculated with the rate of inflation, the current average salary for West Virginia teachers was only three thousand dollars more than teachers’ salaries prior to the 1990 strike. This put the state’s teachers’ pay at forty-eighth in the country. The twenty-eight years between the two strikes had slowly eroded the important gains won in 1990. The state government’s initial response to this year’s strike also echoed Tompkins’ and Caperton’s attempts to quash the 1990 uprising. Governor Justice at first stated that a 2 percent pay raise in one fiscal year for teachers and school service personnel — around $808 per teacher — was the most the state could afford. This, combined with Attorney General Patrick Morrisey’s attempted legal action, did successfully bring union leadership to heel only four days into the 2018 strike. Leadership from the WVEA, AFT, and WVSSPA, fearing injunctions that could bankrupt their unions, huddled around the governor to push him to promises of a 5 percent raise in return for an end to the strike. This, of course, is where the course of the 1990 and 2018 strikes diverge. In 1990, it was Meadows who led the union’s refusal to cave to the state’s manipulations. This time, it was on rank-and-file members to push the strike beyond these opening offers.This February 28, union leaders and state officials called for a “cooling off period,” and superintendents began preparing for school the next day. But soon enough, news traveled that three southern counties — Wayne, Cabell, and Mingo — had called off school operations, fearful they would not have enough staff to legally run the schools. By 10:30 that evening, all schools had closed yet again. The #55United movement had not been deterred, and had managed to maintain unity across the state, something the 1990 strike neared but never fully accomplished. Superintendent support for the 2018 strike altered its dynamic, too. West Virginia schools are separated by county, and each county maintains a board of education and county-level superintendent. Whereas in 1990, superintendents were not made aware of walkouts in advance, in 2018 a sustained ground campaign to win support from superintendents shifted the balance towards labor. Local WVEA and AFT presidents met routinely with county superintendents in the lead-up to the initial walkouts, planning food distribution services and discussing the action’s legality. As the strike went wildcat, the state superintendent backed efforts to defy Attorney General Morrisey’s power, knowing his injunction could only be authorized if the county boards of education requested it. Despite these divergences, in both strikes, educators defied legal threats, instead charting their destinies away from the demands of the state. The 2018 strike too won some resounding victories while shedding light on daunting battles to come. Educators returned to work with a 5 percent pay raise ($2,020 for next fiscal year), the removal of the condescending health program Go365 from their mandatory health-care plan, a permanent tabling of charter school bills, a guarantee that teacher seniority status would not be altered, and the promise that a PEIA task force would provide stability to public employees’ insurance plans. Yet a source of long-term revenue still eludes the joint task force that Governor Justice has assembled to tackle financing for PEIA. A natural gas severance tax failed to pass the legislative session that preceded the strike, and co-tenancy — a term used to describe the ability of natural gas companies to drill on private property without express permission from the landowner — passed through the House and Senate without much trouble. These are daunting challenges for public employees in West Virginia, who rightly fear that the hard-won gains of their strike will be eroded as they were after 1990. Michael Mochaidean is a high school social studies teacher and labor organizer with the WVEA and IWW in West Virginia.